I was introduced to playing Dungeons & Dragons in the early 90s – specifically the second edition of Advanced Dungeons & Dragons. As fate would have it, I wouldn’t participate in an ongoing roleplaying game campaign with any sort of frequency for another twenty years. That didn’t stop me, however, from giving non-board-based tabletop games a very special place in my heart and my imagination over those decades. I had a vague, untested idea of what RPGs actually were, but I was quite sure that they were part and parcel of my geeky predilections. I treated my set of polyhedral dice like precious, untouched gemstones. It wasn’t until I had the good fortune of befriending My Entertainment World’s own Leeman Kessler that I was able to finally spend time testing my romanticized notions of what it actually meant to cast an icosahedral die with any emotional investment in how it came to a stop. An upside of this was that my culinary palate had developed sufficiently for me to appreciate high-quality snacks and adult beverages at the games table rather than settling for the substandard junk food befitting an adolescent’s budget. Because everyone at that table was an adult, it also meant the investment of time in the activity was mutually recognized. We had actively chosen to participate and play. We weren’t just stuck together by circumstance and doing something nerdy to stave off boredom. Beyond being our host for these sessions, Leeman was the Game Master. And a very good one at that. He and I had worked together theatrically on several projects – him acting, me directing. It was a great pleasure to learn that Leeman brings the same degree of preparation and commitment to the table as he does to the stage. Whatever respect and reverence I’d had for the role of GM to that point multiplied exponentially. That’s why, when I first started to seriously consider taking on the responsibilities of GMing myself, Leeman was the first person I approached for advice (something I continue to do, in fact). I love the way roleplaying games bring together all of my favourite aspects of creating theatre. GMing in particular draws on both acting and directing in ways I could not have anticipated. I don’t find it surprising that the trend of RPGs emphasizing storytelling over the traditional elements of wargame-esque strategizing and gameplay has led to more interest by creative people in playing games like the 5th Edition of D&D. Though that may partially be my perception resulting from members of the comics industry, whom I follow on Twitter, starting to talk more about RPGs. Regardless of actual statistics or the journeys of others, I know that, since expressing my interest in GMing and actually doing it, more people I know have come out of the woodwork to tell me of their curiosity about taking the plunge into the hobby. On May 18th, 2016, I presided over a D&D character creation session for the first time with a group of individuals who committed to meet on an approximately biweekly basis. We’ve met 15 times since then, spending an average of four hours together at a time to build a world and imagine collaboratively. I rank it very highly among the most satisfying creative projects in which I have ever participated. And I consider myself fortunate to have a group who has been patient with me through my on-the-job learning. 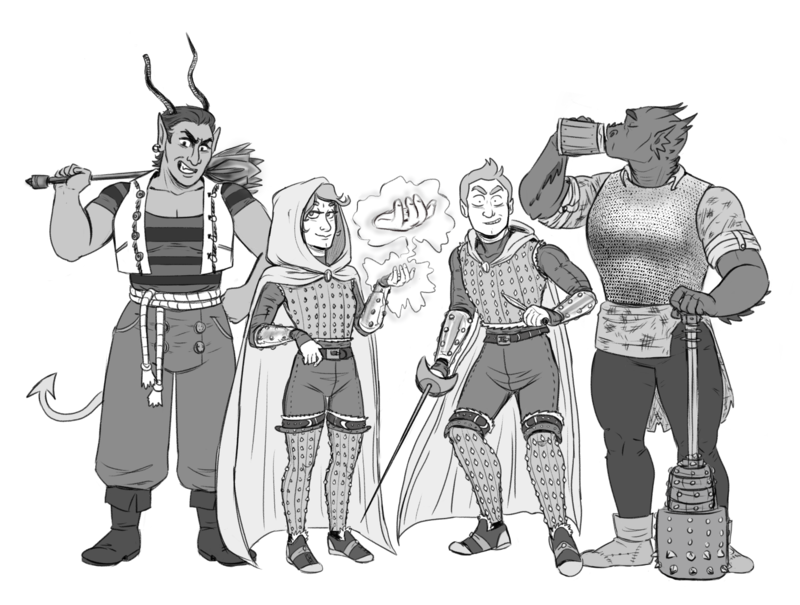 When the holiday season rolled around at the end of last year, I commissioned a portrait of my players’ characters. I wanted to be able to show the world a snapshot of these heroes who are on an intricate adventure which was pulled from my imagination and is being shaped and refined by four excellent human beings I’m proud to consider my collaborators and my friends. I hope to one day look back upon them as only the first such group. I could not have anticipated that GMing would be just what I needed through the tumult of 2016 and the early months of this year. When I learned that March 4th is somewhat informally recognized as GM’s Day, I knew today would be the perfect time to thank all of the GMs and players with whom I have shared a table and to encourage anyone who likes telling stories to explore playing RPGs as a player or as a GM (wearing that hat is truly not as daunting as it may seem). The games out there cover a wide spectrum of rule rigidity – there really is something for every imagination and creative knack. I’m also a sucker for a good pun and couldn’t resist the opportunity to cheer you on if you want to March Fo(u)rth on your journey! There are so many adventures just waiting to begin.